Werner Herzog is more than a filmmaker to me. He's more like a father. 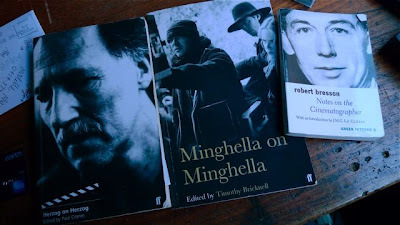 And this book is full of all the fatherly advice (about filmmaking and life, of which the two for him are forever intertwined) and sage like wisdom you could ever expect, need or want. Just looking at the cover gets me excited. I'm not a huge fan of all of his films. But I'm a huge fan of this book. It's one of the most educational and down to earth documents of a filmmakers approach and process. It kills me that someone can communicate ideas and experiences with such apparent ease and simplicity. The chapter on his experience of making his firsty American studio film is one of the most soberingly honest accounts of Hollywood I've ever read. Are you serious? Depending on where you live, you can buy this 1 cent? 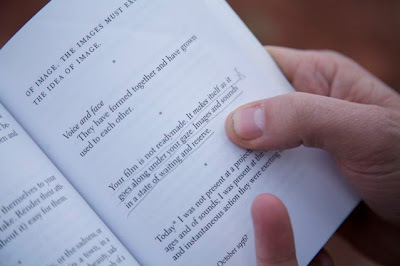 Robert Bresson's pocket sized book of cinematic meditations is full of film secrets and revelation. When in doubt a simple flick to a random page can focus, inspire, and suggest a fresh approach to the job at hand. No other book has given me so much. When on set I keep it in my pocket and consult it regularly. It's of and about a particular cinematic sensibility but I highly recommend it to any filmmaker.